Square peg in a round hole? We know you feel that way with other registration systems. We’ve got the features you need to be a perfect fit. 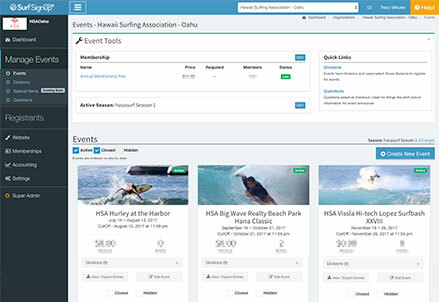 With nearly all of the major surfing event organizations using Surf Signup, we have the most comprehensive list of events, exposing your events to new and aspiring competitors or surfers. Our event list is syndicated to promote your event. With over 10,000 Surf Signup members, many surfers already plugged into the network. Your events are automatically Search Engine Optimized (SEO), plus we also have some secret sauce (embed structured data) to have your events featured and indexed with Google and Yahoo. 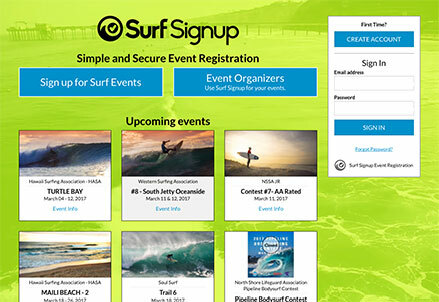 Events listed with Surf Signup are optimized for social sharing. We are making constant improvement to keep up with the different social media techniques. Easy To Use. No Nerds Required. With over 20 years in the surf industry we aren’t a faceless service, but a group of individuals accessible by phone, email and Skype for personalized support and answers. You can setup your events or let us do it for you. Unclear about features? No problem… call, Skype or email us. Supporting your athletes on signup. Signup issues and questions are rare because our system is easy to use, but when they occur, we support signup related questions directly. Registration start and cut off dates. Smartly display only age and gender competitor qualifies for. No signup mistakes and avoids a long list of divisions for better user experience. Limit registrations with a maximum capacity. If membership is required, users can’t signup without a valid membership. If you have a membership model, you know how powerful this is. Memberships can, annual, season or by date/term. 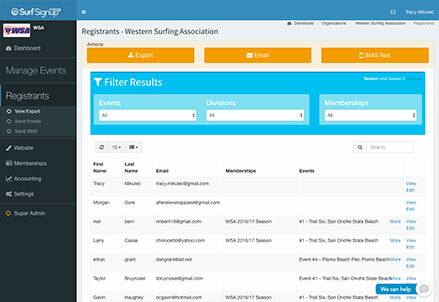 Membership database can cross over with other event series (must be on Surf Signup). Coupon for price discount or comp a competitor with a free registration code. Day of event or a predetermined date you define. Export to Excel to create your heat sheets or competitor lists. 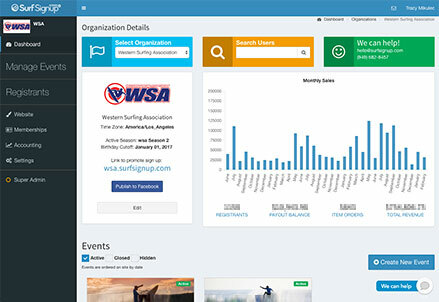 Events, memberships and data are separated by seasons, which helps in many ways. Whether you have camps, banquets, movies , trips or any other activity you can come up with, we have the marketing and features you'll want. Make a bunch or just a single event. Create as many options as you need. Encourage advanced sales with early registration discount with date cut off. Coupon for price discounts or comp a user with a free registration code. Have your events be found in search engines, our index and syndicated to other event and media sites. Registration and optimized for speed and ease with no extra steps or unnecessary fields to complete. Register multiple athletes and children with a single order. Mobile, tablet and desktop. Perfect for when on the go and at the beach. 30-40% of all signups will be from a mobile device. 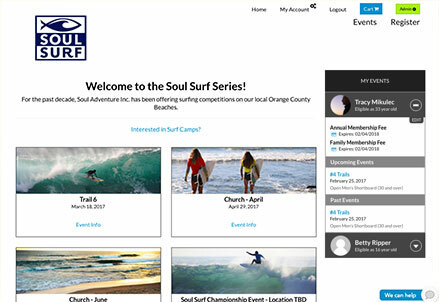 Competitors may already be signed up with Surf Signup, making it even easier to register for your surfing event. Displays only divisions athletes are eligible for based on age and gender. Athletes pay online eliminating the hassle of collecting cash and getting signups day of event. Competitors are charged a service fee when payment is made. While Surf Signup is free for organizers, banks charge a processing fee for each credit card transaction. Learn More Payouts are initiated 5 business days after your event’s end date. Direct deposits can take up to 5 business days to show in your account. You can see the status of your payout on your Event Dashboard under the account tab 24 hours after your event ends. Under certain circumstances, it is possible to get your money prior to event. Please contact us for details.